Danny’s Sculpture of Jane Laurie as part of Lucien Freud exhibition,’ Gaze’ at Irish Museum of Modern Art, Dublin, 2019. Sara Baume, author of ‘A line made by walking’ opens ‘Site’ exhibition at Doswell Gallery, 2018, and treats the artists to some of her new writing. 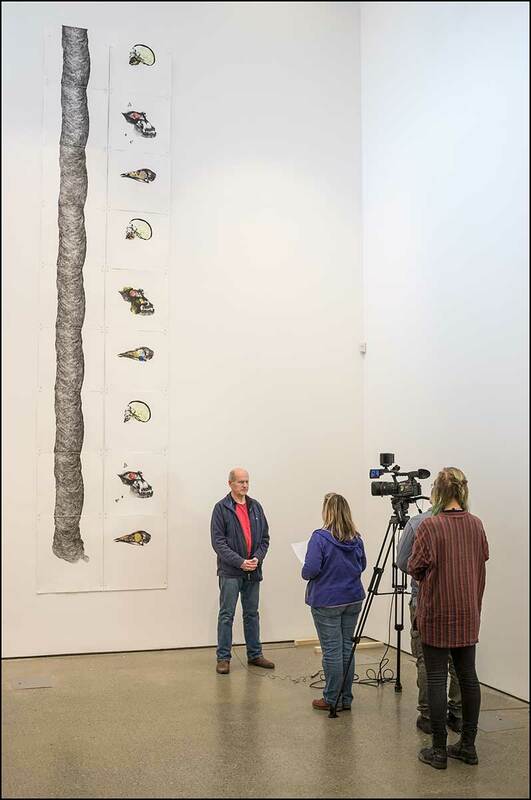 Danny and Frieda’s large print ‘Mater’ at the Uillinn opening of Landmarks and Lifeforms exhibition, 2017. Photo; Kevin O’Farrell. Manchan Magan in full flight opening “Landmarks and Lifeforms’ 2017. Detail of bronze on Bryans Pearson’s headstone, Iqaluit. 2018.